Your yoga and surfing vacays are good for all levels of yogis and surfers. The instructors have more than 17 years of experience. 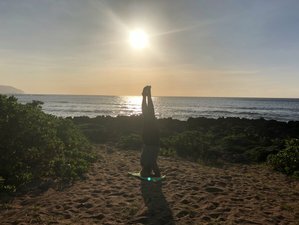 Lumi Yoga welcomes you to come with them in the Hawaiian Lumi House. They really want you to feel at home with them. They and Hawaii are waiting for you. Reetta is the owner of Lumi Yoga and Surf. She does it with her whole heart. She loves all of her customers and loves her work. She has practiced yoga now 19 years and taught 15 years. It is her passion and hopes she can share some of it to you. Yoga has given so much to her. She does her best to give you the best experience. She has practiced through all her injuries and pregnancies. So she knows how to modify practice to everyone. She used to do competitive sports before yoga and because of that, she has gone through 16 surgeries before she worked full time as an osteopath. This retreat will take place in Waialua, Oahu North Shore.